A sunflower is a promising plant. As a part of an industry, it doesn’t lose its appeal in the production of oil and sunflower seeds. Fields get more sown with seeds year by year, and the number of goods exported abroad is growing. Nowadays there are more than 400 species of this plant and its hybrids registered in Ukraine, however, scientists say that it is possible to develop the same amount of new varieties! That is why there is something new every year. What varieties and hybrids are there? What are the most common ones? Let’s find out! Varieties vs Hybrids: What is the difference? Mid-early maturing. They become ripe in 100 days. Oil content is up to 55%. Good crop capacity. Mid-late maturing – 110 days and more. Oil content is 43-54%. The best crop capacity. Every year plant breeders develop new hybrids to make them give better results for their endurance and taste qualities. At first glance it may seem that all the sunflowers are the same. But it is not like that. If you place two plants next to each other, you can instantly spot the difference. If everything is clear about hybrids, then the varieties are more difficult to understand: you need to have a look at their basis. Which ones are the most popular and resistant? This variety is a thoroughly developed “Don large-fruited”. It is high-yielding and reaches medium ripeness. 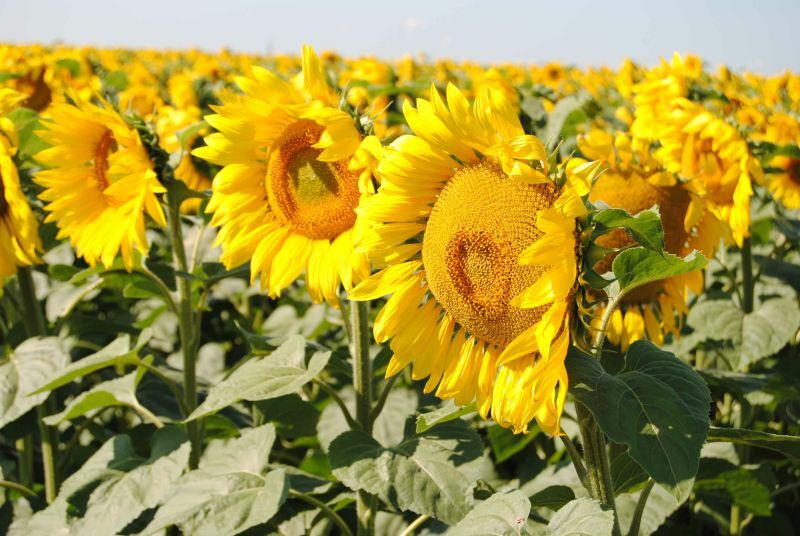 Up to 3-4 thousand sunflowers can grow on a hectare. On top of that, the seeds are big and heavy. This variety is a perfect honey plant. “Lux” is resistant to various common diseases and pests. It is developed out of the varieties “Lakomka” and “SPK”. Its height is 160-170 centimeters, and the growing process lasts 104 days on average. The yield and weight of the seeds are even greater than those of the previous variety: 147-150 grams per 1000 pieces. Oil content is 46-50%. These sunflowers are ultra early. The name of the variety perfectly reflects its characteristics of sunflowers. They have high resistance to diseases, and they strike roots well. They grow under any weather conditions. Oil content is splendid – up to 55%. If you are looking for a not fussy variety, then “Atilla” is a perfect choice. These sunflowers love the sun in every sense: they cannot be defeated by drought! The yield is amazing: the weight of sunflower seeds per thousand pieces is 65-70 grams, and the oil content is 56%! A downside: they are not really resistant to rotting. Varieties and hybrids are chosen based on where the crop will be sown, what weather conditions there are and what technical characteristics are required. “Kaissa-oil” uses only the best species for production!